Nearly a year after they went on strike and inspired educators nationwide to do the same, West Virginia teachers wielded their power again and this time politicians were quick to listen. Just hours after West Virginia teachers went on strike for the second time in a year, the state House of Delegates voted, 53-45, to indefinitely table an omnibus education bill the educators saw as retaliation for the job action they took last February. The vote prompted the teachers' unions to announce they would return to classes on Thursday. But while Senate Bill 451 -- loathed by teachers because it proposed establishing the state's first charter schools and funds for private school vouchers -- appeared dead, the state's three biggest teachers' unions continued the strike for a second day on Wednesday to "make sure this is a dead deal." "We believe that there is still a minute opportunity for something to happen," Dale Lee, president of the West Virginia Education Association, said at a news conference at the state capital building in Charleston Tuesday night. Despite calls from Gov. Jim Justice and Steven Paine, the West Virginia superintendent of schools, for teachers to go back to work on Wednesday, the teachers' unions instructed educators to return to the state Capitol building instead to make sure the state Senate leadership knows they mean business. "We cannot trust the leadership in the Senate," Fred Albert, president of West Virginia chapter of the American Federation of Teachers, said at the news conference. "We are staying out one more day to ensure that this is a dead bill." With little warning and a lot of anger, Mountain State teachers went on strike Tuesday, prompting school administrators in 54 of 55 counties to cancel classes for more than 200,000 students. The strike was called Monday evening in protest of state Senate Bill 451, which seeks to overhaul education. The state Senate sent the bill back to the House of Delegates Monday with amendments to allow the establishment of charter schools in the state. The bill also provides public money to fund vouchers called "education savings accounts" for parents who home-school their children or send them to private school. The House of Delegates voted to put the bill it on the back burner just hours after teachers went on strike. "The Senate can amend it into another education bill. We can't take anything for granted," Jennifer Wood, spokeswoman for the West Virginia chapter of the American Federation of Teachers, told ABC News. "There is a history with the Senate leadership. Teachers don't feel like they argue in good faith." Despite the bill including raises for teachers, Albert said educators were "left no other choice" but to go on strike to stop the erosion of public education in the state. Randi Weingarten, president of the nationwide American Federation of Teachers, posted a message on Twitter Tuesday saying the Republican-dominated West Virginia Senate "is keen to destroy public schools & retaliate against its teachers." Lee, the West Virginia Education Association president, said the Senate bill was rammed through and sent back to the House of Delegates with little to no input from teachers. "It appears that they are more interested in listening to the outside interests than they are the educators across West Virginia," Lee said at news conference Monday. State Senate President Mitch Carmichael, R-Jackson County, said the bill has "great provisions" in it, including additional 5 percent pay hikes on top of 5 percent raises teachers won after striking nine days last year. The bill also creates a $250 tax credit for teachers on the purchase of classroom supplies or other educational materials. He said the bill's goal is "getting our education system out of the doldrums." "Why would anyone want to stand in the status quo and stay in the past?" Carmichael said. 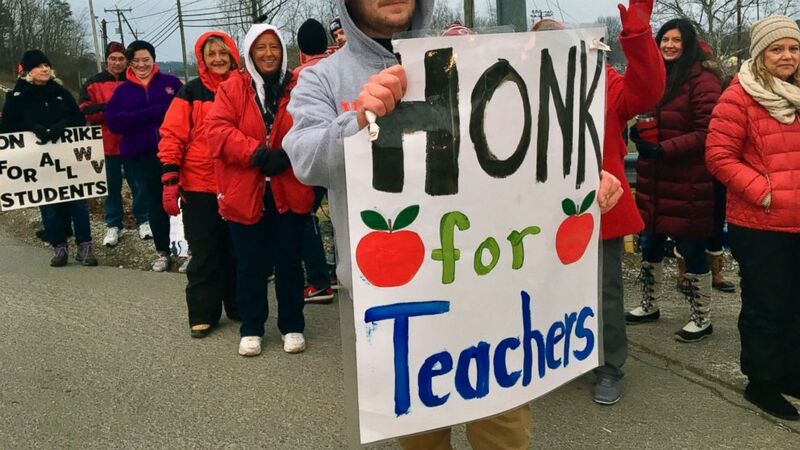 Last year's West Virginia teachers' strike, which started on Feb. 22, was followed by strikes in Oklahoma, Kentucky, Arizona and most recently Los Angeles and Denver. West Virginia has no comprehensive collective bargaining statutes, meaning public school budgets are set by state legislatures and not local school boards like in California and Colorado. In states like West Virginia, Oklahoma, Arizona and Kentucky, strikes by teachers are considered illegal and educators risk being fired for participating in them. Because teachers in those states have shown statewide solidarity in their job actions, state government leaders have had little choice but to bargain. "What's happened in all these places is over the course of the last 10 to 15 years is that people have tried to make good schools and students front and center have gotten demeaned, disparaged, called names, schools have been divested," Weingarten told ABC News in an interview last week. "And so what has happened ... is a sense of possibility that when you join together you can indeed be stronger together, but you have to join together on a mission that the community really adopts." The West Virginia strike comes ahead of one being planned by Oakland, California, teachers on Thursday. The Oakland public school teachers' contract expired in July 2017. The union and the Oakland Unified School District began bargaining on a new contract in December 2016, but after 30 negotiating sessions encompassing 200 hours of bargaining, an impasse was declared on May 18, 2018. Both sides agreed to mediation but that failed to break the stalemate. As part of the negotiations, an arbitrator was assigned to do a fact-finding report. The report showed an 18.7 percent annual turnover rate for teachers in the school district. To stem the tide of teachers exiting the Oakland Unified School District, which has more than 37,000 students, the union is asking for a 12 percent raise over three years, smaller class sizes and more support staff. The school district has offered a 5 percent raise over three years, retroactive to 2017.